Clear all double jellies(14) and reach 20000 points to complete the level. This level look little hard as it level has different board with 41 candies and you need to play with just bottom 25 candies. You need actually luck and if you will have more same color candies then you could easily clear this level by making special candies and moves. 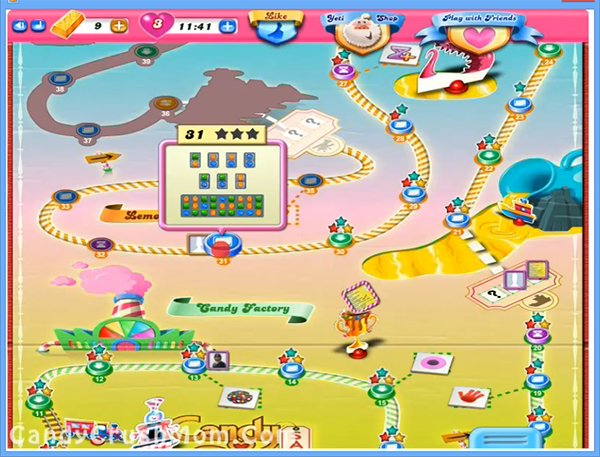 If you can’t find more same color candy then you should restart the level and play again. To break jellies you need to create special candies and that you could make by combing 4 same color that will give striped candy or combining 5 same color candy will give colorbomb or making ‘T’ or ‘L’ shape of candies will give wrapped candy. Some special move you can make is by combining wrapped candy with striped candy will break three lines horizontally and vertically or combining color bomb with striped candy will change all same color candies in to striped or combing wrapped candy with colorbomb will break all same color candies and all these moves could help to break jellies that are above easily with less moves. We completed this level with 100600 points within just 5 moves be using lot of special candies and colorbomb plus in the end we got fish booster that ate candies randomly.